What’s the Best Capital One Business Credit Card for 2019? Signing up for a business credit card is a small but important step in legitimizing your small business. Not only does it separate your personal finances from your business expenses, but it also allows your business to start building its business credit score. Finding the best credit card for your small business will depend on what you’re hoping to get out of a card and how your company’s expenditures break down annually. Capital One offers five small-business credit cards, which offer a wide range of rewards, services and features, so you can find the card that fits your business. Overall, Capital One's cash back cards offer more flexibility than its travel cards—for the same rate. If your annual credit card expenses are higher than $19,000, consider either the Capital One® Spark® Cash for Business or the Capital One® Spark® Miles for Business. If your annual spending is below $19,000, consider the Capital One® Spark® Cash Select for Business or the Capital One® Spark® Miles Select for Business. If your company is new, or you don't have a personal guarantor with excellent credit, consider the Capital One® Spark® Classic for Business. 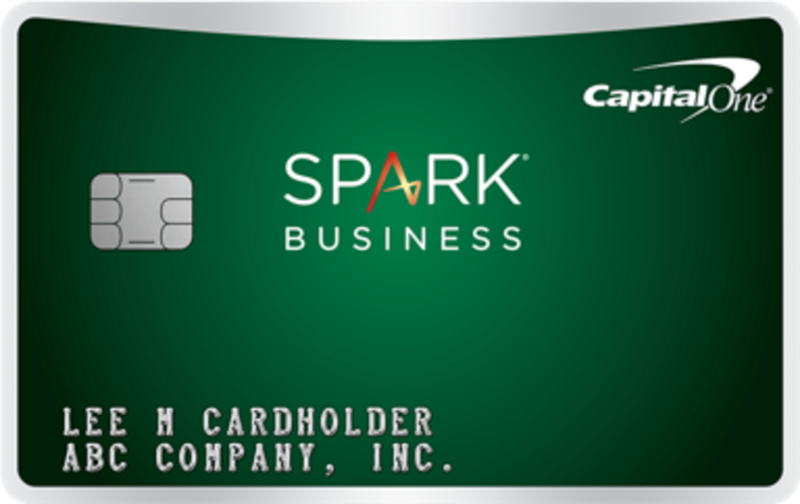 Overall, the Capital One® Spark® Cash for Business card is the best business credit card offered by Capital One. It comes with a solid 2% cash back on all spending in any category, meaning you don't need to worry about strategically charging certain purchases to certain cards. Currently, Capital One is offering a $500 sign-up bonus after you charge $4,500 to your card within three months of opening your account. You could potentially get a higher sign-up bonus from other cards, such as the Ink Business Preferred℠ Credit Card, but $500 is still a strong incentive to sign up—especially since the annual fee is waived for the first year. You won't find a higher sign-up bonus from any other Capital One business credit card. Because the Capital One® Spark® Cash for Business comes with a $95 annual fee, it only makes sense to choose this card over the Capital One® Spark® Cash Select for Business (reviewed below) if your business will spend more than $19,000 per year on the card. That's because at $19,000, the difference in rewards rates between the two cards covers this fee, and the rest is additional profit. However, since the annual fee is waived for the first year and the sign-up bonus is larger, it may still make sense to open an account for at least one year. The Capital One® Spark® Cash Select for Business is the toned-down version of the Capital One® Spark® Cash for Business. Its rewards rate and sign-up bonus are less attractive, but ultimately, it will work better for small businesses that charge less than $19,000 per year to their card. One of the major perks of the Capital One® Spark® Cash Select for Business is the fact that there's no annual fee. That means you're earning a profit with the card from your very first purchase, and you don't need to worry about spending a minimum amount to make the card worthwhile. Like the Capital One® Spark® Cash for Business, the Capital One® Spark® Cash Select for Business offers a simple, flat rewards rate for all purchases—no worrying about categories or quarterly bonus categories. However, because there's no annual fee on the Capital One® Spark® Cash Select for Business, its rewards rate is lower. You'll earn just 1.5% back for every dollar you spend with the card. This is an average rewards rate for low spenders, but if your business is likely to charge more than $19,000 per year to the card, you'll be better off choosing the Capital One® Spark® Cash for Business, since the higher rewards rate will make up for the annual fee. You'll receive a $200 cash bonus after you spend $3,000 on your card within three months of opening your account. This is significantly less than the sign-up bonus you'd get with the Capital One® Spark® Cash for Business, but you don't have to spend as much money to qualify for it, so it may be more attainable for businesses with lower monthly expenses. The Capital One® Spark® Miles for Business comes with the same rewards rate and fees as the Capital One® Spark® Cash for Business, but with an airline-focused twist. Instead of 2% cash back, you'll earn 2 miles for every dollar spent. And instead of a $500 sign-up bonus, you'll receive 50,000 miles after you spend $4,500 within the first three months. 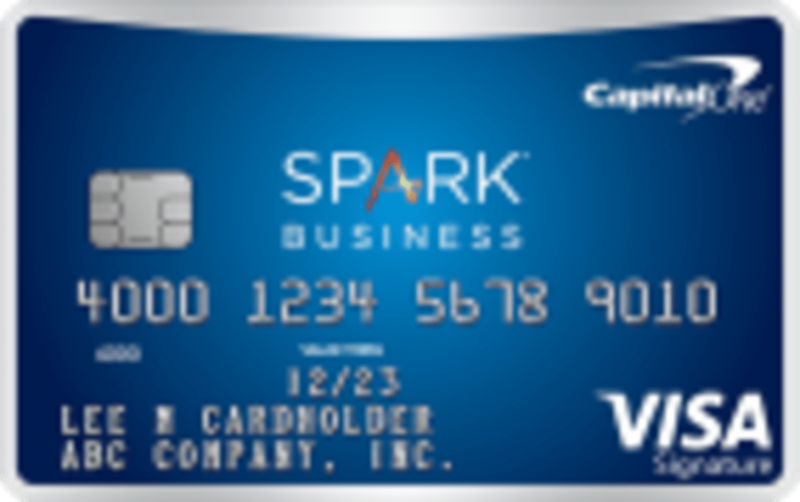 Also, the Capital One® Spark® Miles for Business is subject to the same $95 annual fee (waived the first year). These miles have the same cash value as the rewards you'd earn with the Capital One® Spark® Cash for Business, but the miles are less flexible. You can apply cash rewards to any purchase, including a travel-related transaction. But miles can only be redeemed for travel. This isn't a problem if you plan to travel a lot for business, but if you're not sure how you'd like to redeem your rewards, you'd be better off choosing the Capital One® Spark® Cash for Business. Like the Capital One® Spark® Cash for Business, the higher rewards rate you receive with the Capital One® Spark® Miles for Business only makes sense if you intend to charge more than $19,000 to your card in a year. If you don't, but you want a Capital One travel card, you'll be better off with the Capital One® Spark® Miles Select for Business. The Capital One® Spark® Miles Select for Business is the airline counterpart to the Capital One® Spark® Cash Select for Business. You'll earn 1.5 miles for every dollar you spend; you'll earn 20,000 miles after you spend $3,000 within three months of opening your account; and you'll pay no annual fee. If your business expenses are below $19,000 but you do intend to travel periodically, this card could be a good match for you. 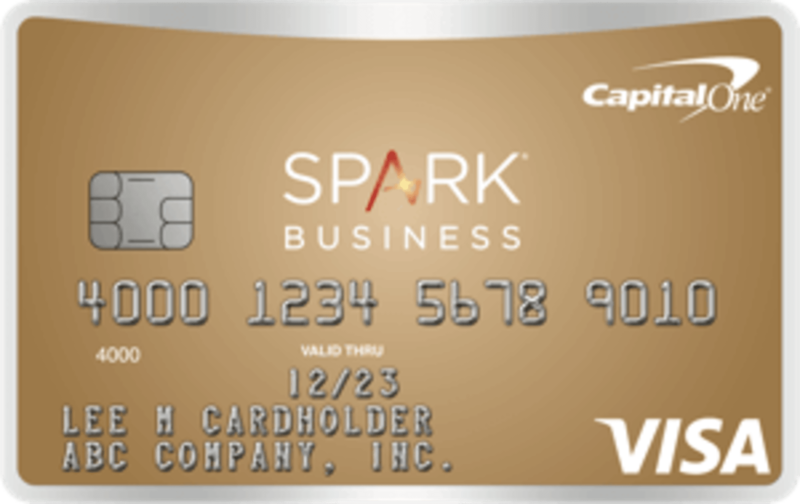 But as with the Capital One® Spark® Miles for Business, these miles are less flexible than the cash rewards you could earn with the Capital One® Spark® Cash Select for Business, so it might make more sense to just choose the cash version of the card. The Capital One® Spark® Classic for Business is meant for brand new businesses with no business credit score and no guarantor who can help you secure a better card. While its rewards aren't that impressive, it can be a good tool for new businesses to use to build their credit. The Capital One® Spark® Classic for Business doesn't come with any sign-up bonus. But it's also a no-fee card, meaning you can sign up without worrying about whether it's worth it. Ultimately, the only incentive for signing up for this card is to secure a line of credit for your business—not to earn rewards. With the Capital One® Spark® Classic for Business, you'll earn just 1% cash back on all purchases. While this isn't a stellar rewards rate, it will amount to a small bonus for you as you build your business' credit and work toward qualifying for a better card. Should I Choose a Miles Card or a Cash Card? Choosing among these cards comes down to the type of rewards you want: cash back versus miles. There is no value difference between the cards within each tier (both annual fee cards provide the same rewards rate and bonus values). You may still use the cash back against travel statement credits, and you will get just as much value out of it as you would with the Spark® Mile cards. The converse is not true, however. If you use miles earned through the Spark® miles credit card for cash back, you will get a lower return. Which Capital One Business Credit Card Offers the Lowest Interest Rate? The two no annual fee Spark® credit cards offer the most competitive interest rates. The Capital One® Spark® Miles Select for Business and the Capital One® Spark® Cash Select for Business both provide 0% intro APR on purchases for the first nine months of card membership. This is not, however, the longest zero-interest period we’ve seen on a business credit card—that honor goes to the Ink Business Cash℠ Credit Card, which charges no interest for 12 months. If your company is having trouble making payments to vendors, we encourage taking advantage of the 0% period some of these cards offer, but avoid paying any additional interest once that period ends. How Do the Capital One Business Credit Cards Compare to Other Cards? Among the top issuers—Chase, Citi, American Express, US Bank and Bank of America—the Capital One business credit cards provide relatively low rewards. Other issuers tend to provide the ability for businesses to specialize in several particular merchant categories, giving higher rewards on those purchases. For example, the Ink Plus® Business Credit Card earns an effective rewards rate of 5% on the first $50,000 in purchases at office supply stores and on cellular phone, landline, internet and cable TV services each year. Also, the card will earn users 2% back on the first $50,000 spent at gas stations and hotels each year. While these rates are equal to or better than any of the Spark® cards, the advantage is limited to those specific merchants we outlined. On all other spending, the Ink Plus® Business Credit Card will produce just a 1.25% rewards rate, which is significantly worse than what you can get with Capital One. Therefore, if you can’t find a credit card at any of these other merchants that matches up well with how you spend your money, we recommend considering one of the Spark® cards. The information related to the Ink Plus® Business Credit Card has been collected by ValuePenguin and has not been reviewed or provided by the issuer of this card prior to publication. Terms apply to Chase credit card offers. See chase.com for more information. What Kind of Business Solutions Does Capital One Provide? Capital One business credit cards allow you to view quarterly reports on your company’s credit card expenditures. These get broken down into several categories based on the type of items bought and the vendor category (be it office supply, restaurant, etc.). The reports are provided as PDFs, which make them difficult to combine with other accounting software you may already be running. You are able to export spending reports as raw data from the past 90 days, but it would take some work on the cardholder's part to synthesize or combine this data into spending by category or date. Other major issuers provide better solutions and more sophisticated tools to control and manage how your company credit card is being used. For example, Chase business credit cards allow you to instantly file and tag receipts, as well as set individual spending limits on employee cards. These features might matter less for small companies, but become increasingly important as your company scales and more employees get access to the business' credit card account. Our credit card comparison tool allows you to see how each card performs for your unique spending habits. Enter the amounts you typically spend each month to see your potential earnings over a two-year period.